With your Siberian Husky pal, you are bound to experience amazement, joy, love and companionship. You can enjoy wonderful conversations everyday with this bosom pal of yours. A perfect companion we can vouch for! Keen, friendly, alert and mischievous are the apt words to describe a Siberian Husky. Equally appealing is their graceful and smooth gait. A thing of beauty is a joy forever and Siberians really live upto it. They are beautiful not only in their looks but also in their disposition. “Their eyes, in my opinion are limpid pools of sparkling, coloured beauty. Perhaps having the Siberian Husky’s eyes as an inspiration, contact lenses of different shades are in vogue with the human beings,” adds Yash of Yashbans Kennels, a reputed breeder of Siberian Husky. Believed to have originated with Coastal Chukchi tribes of the east-Siberian peninsula, Siberian Huskies are one of the oldest breeds of dogs. They were imported from Anadyr River and surrounding regions into Alaska to be used as sleddogs, especially in the All- Alaska Sweepstakes, a dogsled race from Nome to Candle and back. These dogs are still used in Iditarod Trail Sled Race, a race over 1150 miles of the roughest, most beautiful terrain Mother Nature has to offer in Alaska. The famous ‘Eight Below’ movie by Walt Disney portrayed eight sleddogs, six of which were our beautiful Siberian Huskies. The movie shows how these intelligent, courageous dogs fight to make it through the most unforgiving winter. Both dogs and their parents make a remarkable journey of grit, endurance and belief to find one another again in a spectacular but perilous land. One look at a Siberian Husky and you are bound to think that he is a perfect picture of balance, power, agility and endurance. He is a medium sized, moderately compact working dog, quick and light on his feet, fast moving and extremely graceful. Other characteristic features include dense coat, erect ears and a brush tail. His face is expressive, friendly and even mischievous. His almond-shaped eyes are placed slightly slanted upwards. And when it comes to the colour of their eyes, they can be varied – all shades of brown or blue, or one of each, or particoloured. His ears are medium size, triangular, and set close and high on head. His well furred tail is like that of fox and set just below the level of the topline. A Siberian Husky carries it over the back in a graceful, sickle curve. “A trailing tail is normal when the dog is in repose,” tells Yash. The Siberian Husky comes in a variety of colours, from black and white to pure white. “He has striking head markings, a cap like mark or spectacles, which is a typical feature of this breed. Breeding these wonderful dogs is challenging and exciting as they come in so many colour variations and wonderful eye colours,” adds Yash. The average height of the males is 21-23 inches while that of females is 20-22 inches. The males weigh around 20-28 kg while females weigh between 15 and 23 kg. The Siberian Husky’s affectionate nature, gentle behaviour, friendly disposition and loyalty make him a great pet and an excellent companion. “The best quality of them as an animal is the affection and the love that they want to give. Being gentle dogs, they make safe companions to children and the elderly,” tells Yash. A Siberian is highly intelligent with an eager disposition. He is a willing worker. However, he is not much of a guard dog. He has great stamina and sustained power for long distances. He would like to run and run and play. A Siberian Husky is very gentle and affectionate with clean habits. He is extremely adaptable to live in the house as a pet and companion. “He is neither too small nor too big to own. He is of the right size to live in a house as well as an apartment,” tells Yash. “Although Siberian is generally non-aggressive and gets along with other breeds of dogs quite well, but if he is attacked, he will not take things lightly,” tells Yash. The Siberian Husky loves to live in a cool place and they should be given plenty of water to drink at all times. The Siberian Husky is one of the easiest breeds to maintain. “Just make sure that your puppy is from a reputed breeder, has had all his initial vaccinations, has been socialized at the breeder’s place and has a balanced diet,” tells Yash. Start their training at an early age itself. Pups normally have the habit of jumping on people and this should be discouraged in the beginning itself. Besides this, just love and affection will make him a pleasure to own. Though he has a dense coat, he does not have a doggy odour. Start your Siberian’s grooming schedule at an early age itself so that he will learn to enjoy this experience and this way, the bond between you and your puppy grows stronger. “He is generally a very clean dog, so he rarely needs a bath. Put him on a grooming table and brush him everyday with a slicker brush and a pin brush, if necessary,” tells Yash. As they have a dense coat, it is difficult to make out if they have ticks or fleas or any infection, which can get aggravated over some time. 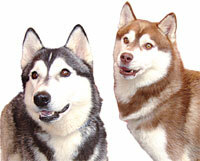 Hence regular brushing is necessary so that you can detect any problem with your Siberian Husky at an early age itself. “Since the Siberian loves to dig, make sure you wipe his paws everyday with a clean, moist towel before you bring him indoors. His nails need to be seldom clipped if he is an outdoor dog. If he is an indoor dog, then make sure you clip his nails or file them, once in every two months,” she adds. “As these are extremely clean animals, I sometimes simply watch in fascination and amazement at the way they groom themselves, especially by licking and cleaning their dirty paws after their playing. They are just like cats!” To clean his teeth and gums, give him chews to gnaw on, or else you might have to brush his teeth regularly with a doggy toothpaste. The Siberian Husky sheds his coat profusely but VERY, VERY RARELY. If he is on a healthy diet and has a clean coat, without any fungal or bacterial infections, he rarely sheds. “In my personal experience, I find my Siberians only shed their coat once they have had a litter and extremely rarely at other times,” adds Yash. As per Yash, there is no laid down rule as to how much exercise you should give your Siberian Husky. “Once your puppy is about a year old, you could take him for walks, run with him, play with him, till you get exhausted and tired,” she adds. “The game that the Siberians love to play is only CATCH ME IF YOU CAN! They will come near you, tease you, and the moment you try to get hold of them, they will dodge and slip away and boldly just stand a few feet away, with that mischievous look, saying once more CATCH ME IF YOU CAN!” tells Yash. “They are very hardy dogs and I am sure if responsible, breeders take up the task of promoting and popularizing this breed in India, we would not come across any genetic problems, especially that of hip dysplasia which most working dogs unfortunately face today, due to irresponsible breeders and owners,” tells Yash. “Since the Siberian Husky loves to dig and climb, make sure that they are kept in escape proof enclosures. Never ever make the mistake of letting them loose to play in parks or open areas. You will have to wait endlessly for them to return back to you,” tells Yash. “So, if you think that the Siberian Husky is the right breed for you, as it is for me, go ahead and get yourself one of these magnificent, beautiful friends,” concludes Yash.